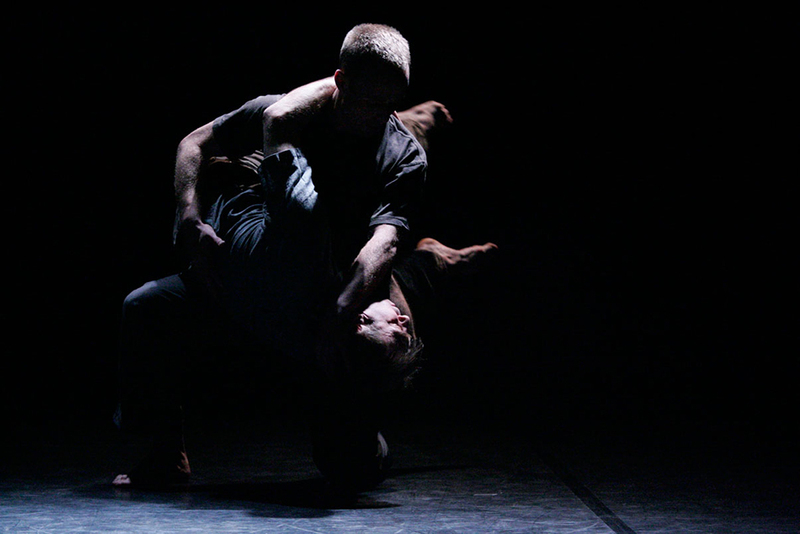 The Siobhan Davies Dance commission is named after a text by Jonathan Burrows which we were given at the very beginning. ‘Traces’ is a mysterious piece of writing which we have re-read after each week of class – it’s meaning shifting in relation to our new knowledge of dance and our own bodies. Burrows likens dance to ‘shining a torch into fog’, and the text grapples with many of the things which make dance so hard to pin down. In trying to get a handle on what it means to dance, we have been struck by the instability of the human; growing and ageing, plastic and porous, our identities wonderfully, terrifyingly unfixed. As I write, we have just completed our fourth week of Independent Dance (ID) classes at the studios – this time led by dance artist, Charlie Morrissey. This did not relieve our feeling of being lost inside the body, but it did deepen our sense that this uncertainty is significant – related to the larger picture of what it means to live as a human. In class, we worked a lot in partnership and contact with the other dancers, improvising and trying to be with them; to be attentive to their movements with our whole body, and to fall into some kind of flow together. We shared sweat and breath and touch with the other participants, in a way that I have been reluctant to in the past – crashing and bashing trunk and limbs in our improvisation, rolling skull over skull, really feeling the weight and heat and solidity of the other bodies in the space. The skin is always sensing, always ‘on’. We see our skin as a container of the ‘self’, our final barrier to the world, and touching skin to skin with another human is normally reserved for moments of great intimacy. With this kind of improvisation, there is no time to fear the next movement, or to reflect on the ones that came before. There is only the moment, and it seems that the more one can be fully present, the more the two bodies can ‘drop in’ together, the more they become one. Charlie’s instruction encouraged us to remain alert to all the senses. There are so many ways we can reach out from our body and touch another; we touch with our eyes as light reflects off an object, the sound of our voice vibrates the other’s ear drum. We are delighted to be at the beginning of a collaboration with Charlie, whose fantastic work and research intersects with our own. Our conversations with Charlie are already shaping our thinking and they will lead to physical investigations and performance to camera. We have been interested in touch for some time – our previous project, ‘Parlor Walls‘ focused on the remote touch of the human voice and the virtual touch of hands, through the YouTube phenomenon of ASMR. With this commission, we will investigate touch as an act with the potential to shape human evolution. We’ve been thinking a lot about an encounter between Neanderthals and Homo-sapiens, where pre-linguistic communication and gesture made interaction possible. This ancient meeting offers ways for us to explore coexistence and human belonging, and to question deeply held myths and stories relating to the human body and evolution. It also allows reflection on the future evolution of humans in relation to developments in artificial intelligence. 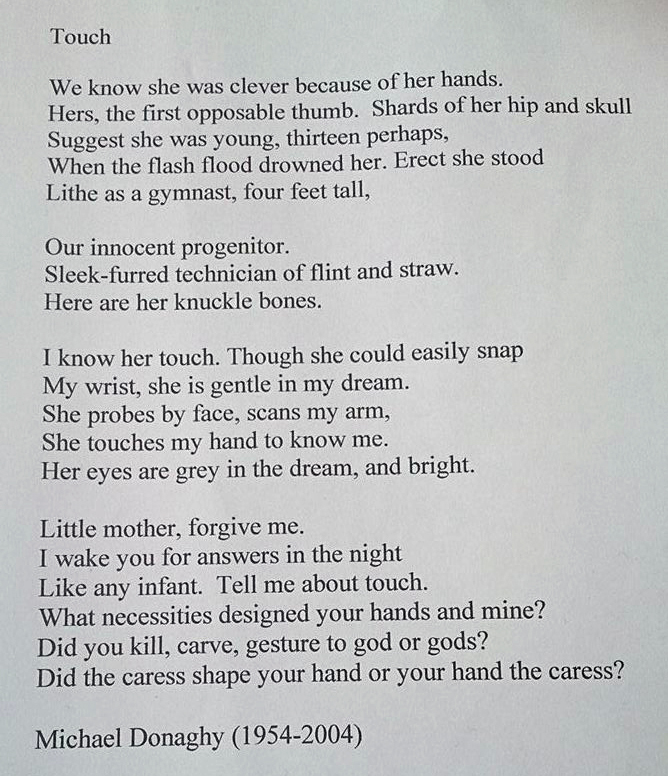 We finish this little blog installment with a Michael Donaghy poem about Lucy, the famous fossil skeleton of our early human ancestors.